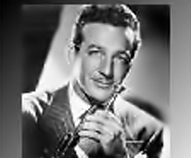 Harry James : Big band charts from the Harry James Orchestra. A range of big band arrangements made famous by Harry James and his orchestra. Harry Haag James was a virtuoso trumpeter, band leader, songwriter and actor who was a key member of the Benny Goodman Orchestra before leaving to form his own band. His band recorded some 30 studio albums and released over 200 singles in a period spanning over 40 years. He was a relatively shrewd businessman who changed the style and direction of his band over the decades in order to keep it in tune with popular musical tastes of the time. Which of his famous charts might you know? James's best known instrumental charts include "Ciribiribin", "Trumpet Blues and Cantabile", "Two O'Clock Jump", "You Made Me Love You" and "James Session". In conjunction with vocalist Helen Forrest he had big hits with "I've Heard That Song Before" and "I Had the Craziest Dream".